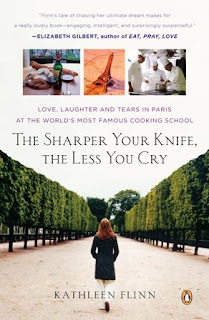 Two weeks ago, I received a copy of The Sharper the Knife, The less you cry, a book that is a combination of food writing / memoir. Specifically, it chronicles one woman’s journey through culinary school at Le Cordon Bleu Paris. Those of you who may have read my blog when I first started, may recall that I myself attended class at LCB Paris. I, however, did just one semester of Intensive Patisserie Basic, while Kathleen Flinn, the book’s author, completed the Cuisine Diploma. Although my personal dream would be to complete the Patisserie Diploma, I was still very much looking forward to reading about Kathleen’s experiences. Perhaps, it would be just the nudge I need to finally follow my dreams – an idea that I have played with in my mind occasionally. From the day that I started the book, I found it hard to put down. It is an easy read, yet at the same time, I found it thoroughly enthralling. The descriptions of the demonstration rooms and kitchens brought back so many much-cherished memories of my time there in August 2005. In fact, as I would learn while reading the book, Kathleen and I may have crossed paths at LCB given that she completed her Superior cycle in August – November of 2005. Although Kathleen’s book centers around her experience at culinary school, it is also at its heart a story about love, as it chronicles the progression of her relationship with her now husband – the man who encouraged her to drop everything and follow her dreams. We all need someone like that in our life and it made me remember once again why I love M so much – he, like Kathleen’s husband, has encouraged me to to re-enroll in LCB everytime I’ve brought it up. As a bonus, Kathleen also concludes each chapter with a recipe. I’ve yet to try any of them but many of them do sound delicious! If you’re a fan of food writing and / or are contemplating going to culinary school, I think you’ll enjoy this book. Thank you for the review! I'm always looking for an interesting book to add to my list. This sounds great. I really enjoy your blog. ah, i am so glad to have come across your blog thru daring bakers and this review! i've had my eyes on this book after seeing it in the bookstore and i'm excited to actually read it now--i love your photography too!